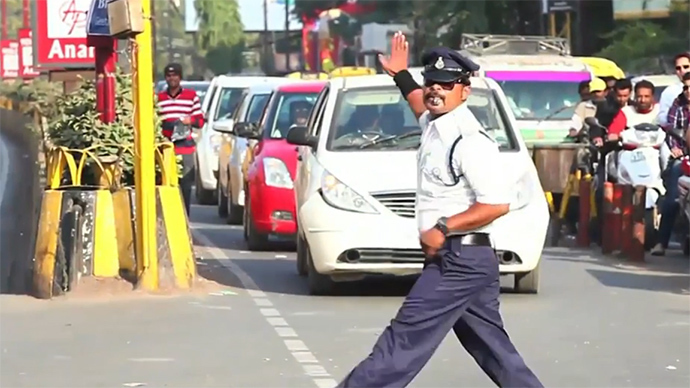 One Indian traffic cop’s dance moves and earnest desire to brighten up people’s day in the sweltering heat has earned him an entire following: the now iconic officer moonwalks his way through his duties, controlling traffic Michael-Jackson-style. We could be looking at a whole dance revolution in traffic control, as Ranjeet Singh braves the confusing and often chaotic intersections of the central Madhya Pradesh state’s commercial hub, Indore. He lists Michael Jackson as an inspiration. “Instead of walking back I do the moonwalk, which sometimes amuses commuters. That, in a way, encourages people to follow traffic rule,” Singh told the Hindustan Times. And the dancing contagion is spreading: three of his workmates have picked up the moondance bug. Before long, Singh found himself training a fresh crop of traffic control cops. Some even list the now-iconic cop as a celebrity from back in their college days. “I used to observe Ranjeet bhai during my college days and wanted to be like him. I instantly approached him for some tips as soon as I got my job. It’s real fun to control traffic in that manner and at no point of time I feel bored,” Sumant Singh Kachhawa, 22, says. He’s not the only one. Police veterans look on with equal admiration. “He is not only an inspiration to constables but for his seniors as well. His style of controlling traffic attracts everyone. He has been exceptional in sharing his style with his colleagues,” additional superintendent Anjana Tiwari explained. Sadly, dancing through the scorching sun isn’t helping to prevent drivers from trying to one-up each other on the road, and Ranjeet believes there’s still a lot of chaos. “There are commuters who don’t wish to follow any instruction. Our job is to tell them but in the end it is their choice,” he said in a Facebook post. Singh has more than 13,000 followers, and many, including school children, line up to take pictures with the local celebrity.